The FOCCUS© Pre-Marriage Inventory is a comprehensive, user-friendly tool for use by lay individuals, couples or professionals who are helping couples prepare for marriage, and who become trained as FOCCUS Facilitators.The FOCCUS© Inventory is designed to help engaged couples appreciate their unique relationship, learn more about themselves, and discuss topics important to their lifelong marriage. To get a sense of the FOCCUS© Pre-Marriage Inventory, view the 10 sample questions below taken randomly from the 151 basic and 33 optional items in the inventory. 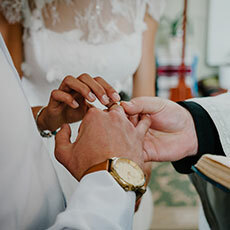 When finished, couples are encouraged to discuss with each other the thoughts, feelings, differences, and priorities that each FOCCUS© Pre-Marriage Inventory item brought to mind.